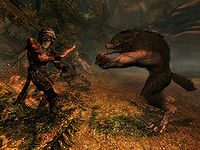 Sinding, a Nord warrior, is a werewolf who was jailed for killing Lavinia, Mathies' and Indara Caerellia's daughter in Falkreath. Speaking to him in the Falkreath Barracks begins the Daedric quest Ill Met By Moonlight. When seen in the jail cell, Sinding wears nothing more than a pair of ragged trousers. If you choose to talk to him about the murder, eventually he will freely admit that he is a werewolf and mention that he sought to control the condition through means of a magical ring. Unfortunately, the ring is cursed by Hircine and causes Sinding to go berserk without warning. He'll ask you to take the ring. If you agree, he will hand over the ring before he transforms and escapes from the jail. He mentions seeking a sanctuary where he won't be able to harm another. Near the end of the quest, you are given the option to either slay Sinding like Hircine asks, or spare his life. Should he survive, Sinding can sometimes be found outside of the grotto in werewolf form. He has been seen skulking around outside of the Honningbrew Meadery coming from Riverwood, and follows the trail west until he gets back to Bloated Man's Grotto. He also may travel east from Bloated Man's Grotto past Whiterun, through Riverwood, south to the gate of Helgen, and then west to Falkreath, walking through the Falkreath Barracks and entering the jail. Everyone is oblivious to the fact that there's a werewolf wandering around, though animals do attack him (wolves do not appear to be allied with him, as they are with you when you are in werewolf form). The reverse may also happen. 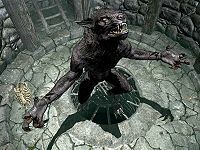 He may instead be found in his cell at the Falkreath jail in werewolf form (possibly human form as well) and will travel to Bloated Man's Grotto, where he will wander back and forth from the campfire to the small pond with the waterfall nearby. The people around him don't seem to react to him, though. He will, however, turn hostile to any enemies who engage in combat with you, or that you attack. Sinding's hostility is not affected by you being in human or werewolf form. Speaking to Mathies about who killed his daughter will reveal that Sinding used to work as a laborer: "Sinding. Came through as a laborer. Seemed like a decent man." He understandably has a deep hatred of Sinding, as he'll continue with: "He's stewing in the pit while we figure out what to do with him, if you've got the stomach to look at him. What could drive a man to do something like this?" He'll also choke up when telling you how Lavinia died: "She was... he ripped her apart. Like a sabre cat tears a deer. We barely found enough of her to bury." Upon ending conversation with him he'll also say, "I just don't understand what kind of a man does that." "Why did this make you attack the girl?" "I had just come into Falkreath. They needed some help working the mill, and I thought that would be something safe. Something I could do. When I saw the little girl, I was just... I could feel it coming on. I could taste the... I needed to hunt. But this pitiful, limited body wasn't meant for hunting. Slow. No claws. Weak, mashing teeth for chewing cud. I held in my rage as long as I could. But it boiled inside of me. She looked so fragile. Helpless prey. And then... ... I feel terrible about what happened. About what I did. It would probably be best for everyone if I just went away." "Do you not know the Daedric Lord of the Hunt? He revels in the chase, and also gave the 'gift' of lycanthropy to mortals. A powerful force, not to be crossed. As I learned too late." "I've been looking for a way to appease Hircine. There is a certain beast in these lands. Large, majestic. It's said that Hircine will commune with whoever slays it. I tracked it into these woods, but then had my... accident with the child. I want to beg his forgiveness. Give him back the ring. But while I'm stuck in here, the beast wanders free." Lastly, you can offer to take the ring to Hircine. He'll be surprised: "Oh my. You would do this for me? Here, take it. I don't want anything to do with this wretched thing anymore." He'll continue by telling you what to do: "Seek out the beast. He wanders these woods. Bring him down and... well, the Lord of the Hunt should smile on you. I wish you luck, but should leave here while I still have my skin." He'll end with: "Should our paths cross again, I will remember your kindness. Farewell." He'll then transform into a werewolf and escape through the top of his cell. After you've hunted the White Stag and caused an aspect of Hircine to appear, Hircine will order you to hunt down Sinding, who is currently hiding in Bloated Man's Grotto, and rip the skin from his body. Hircine will also tell you to hurry, as there are other hunters in the grotto competing for his favor. If you refuse, saying that he's done you no wrong so you won't kill him, he'll answer that he does not want vengeance: "There is no retribution in the hunt. It is not vengeance I seek, but the blood course of a living hunt." Either way you will have to go to Bloated Man's Grotto to either kill or save Sinding. Upon arriving at the cave, you will find a gravely injured hunter, J'Kier. He'll tell you that his group of hunters was killed by fighting Sinding. He'll then die from his injuries. Go further into the cave and you'll find Sinding. Tell him that you've been told to kill him will have him say, "And I would deserve it, wouldn't I? I can't stop you if that's what you want to do. Hircine is too powerful." However, he'll continue, "But if you spare me, I can be a powerful ally to you. And I would promise to never return to civilized life. I know now that I can't live among people." You can now choose to either kill or spare him. "Now let's deal with these other hunters." To save Sinding, say that you will spare his life. He'll be grateful: "Thank the gods. Now let's deal with these other hunters. We hunt together!" A new group of hunters will appear and attack you two. Take care of them and go deeper into the grotto, helping Sinding clear the place of hunters. Once they are no more, mention to Sinding that the last of the hunters is dead, and he'll thank you again: "Thank you for your help. I will make my home here, away from anyone I might hurt." He'll stay in werewolf form, wandering around Skyrim. If you meet him again, he may tell you, "Never thought I'd see you again." On the other hand, if you wish to kill Sinding, tell him, "I cannot defy Hircine. You have to die." He'll accept your choice, saying, "So be it." before he runs towards the cave entrance. Several hunters will be waiting for him, but they are outmatched, and by the time you arrive at the scene many of them will have been killed by Sinding. Kill him and activate his corpse to tear the skin as Hircine told you earlier. Hircine will appear as an apparition of Sinding as a human to congratulate you, saying, "You've done well, hunter." Tell him that you did as he asked, and he'll reply, "And found my favor. That skin will serve you well, child. Look more closely at it. My glories shall protect you from all this world's grievances." He'll end with "Good hunting." and disappear, leaving you with the artifact Savior's Hide. Taking the ring from Sinding makes it auto-equip and it cannot be removed for the duration of the quest (the ring can sometimes be unequipped by your own werewolf transformation, whether deliberate or caused by the cursed ring). Assuming you let him live, Sinding can be found in both the grotto and back in Falkreath jail simultaneously after the completion of the Ill Met By Moonlight quest. If you kill Sinding, he may come back to life at a later time within Bloated Man's Grotto and may also be found wandering the Riverwood and Helgen area in werewolf form. A hunter may become hidden or stuck out of sight within Bloated Man's Grotto, rendering Sinding mute and giving the appearance the quest is finished. Using Detect Life it is possible to locate the remaining live hunter. ? Dispatch the hunter to allow the quest to complete and allowing Sinding to complete his script. 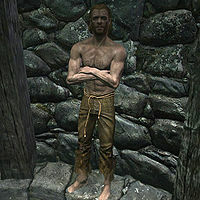 Sinding may get stuck on the stairs in his Falkreath jail cell, which can prevent him from getting close enough to the bars to talk to you, thus preventing the quest from progressing. Reloading a save from before entering the jail may fix this. Alternatively, you can use the console command TCL to disable collision and talk to him inside his cell. In some occasions, Sinding cannot be staggered by a dual-casted projectile with Impact or with shield blocking and bashing, making him much harder to kill. Several copies of Sinding may spawn during the game, some simultaneously both during the Ill Met By Moonlight quest and after, and some at different points of time after the quest. Sinding may take a long time to travel to the cave and it is possible to get there before him. If he is not there, leave the cave and wait several days before re-entering. ? This page was last modified on 23 October 2018, at 10:43.